A Shoe-In or A Shoe-Off! That is the question! The more you do it, the stronger it becomes. It happens without a conscious thought. I’ll share one of my “automatic patterns” ~ I don’t wear “outside shoes” inside my home. The first thing I do when I come inside is take off my shoes. 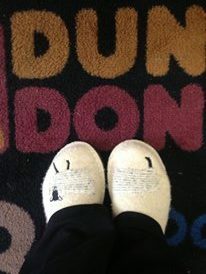 I have my slippers waiting, and sometimes just walk barefoot. For my guests I have a basket of assorted clean and cozy slippers. The other day, wearing my special “inside” purple slippers, I stepped outside the front door for a moment, a few minutes later, I noticed I was bare-footed! We create these automatic patterns all the time. Think about the things you do, the thoughts you have, the things you say, without a conscious awareness. If you created it ~ you can change it! In the meantime, begin noticing your automatic patterns ! Are they a shoe-in for what you desire? Or is it time to take the shoe off!! If you are interested in taking that “outdated shoe off” and replacing it with a “new shoe on ” you can join me at one of my guided clearing meditation classes, my personal clearing class or experience a past life regression.